Ladies and gentlemen roll-up for the world’s largest sporting spectacular, which is set to explode into action in less than 450 days time, (11th June to 11th July, 2010). The soccer FIFA World Cup is going to be utterly massive and as it will be played for the first time on the African continent, you can expect the additional thrills of African adventures like - Big 5 Safaris, Whale watching and Great White Shark cage diving to entertain you between matches. Percy Tours recently had a 2 hour face-to-face meeting in Cape Town with the official ticket issuing company and so I am now able to inform you of what is on offer and all the finer detail of how tickets will be allocated. The most important question that people are asking is - How do we obtain tickets to watch the football? This is a fair enough question, but there is quite a lot of other information you need to digest before we get to that issue, so let's just look at what's what. There will be 3 million tickets issued - 1 million to be sold in South Africa, 1 million sold in the rest of the world and 1 million will be allocated to all the FIFA officials, corporate sponsors like Coca Cola, Visa Card, Adidas, Emirates and Sony, the 32 countries teams and their officials and families. Johannesburg – Soccer City and Ellis Park; Nelspruit – Mbombela; Rustenburg – Royal Bafokeng; Bloemfontein – Free State; Cape Town – Green Point; Durban – Durban; Polokwane – Peter Mokaba; Port Elizabeth – Nelson Mandela Bay; Pretoria – Loftus Versfeld. Ticket allocation will be by lottery for the "normal" tickets, by which people put their names forward for all the matches they wish to watch and then they will be pulled out of an electronic hat. For the 1 million South African tickets, these are only limited to South African citizens at a maximum of 4 tickets per household and for a maximum of 7 matches. On the 20th February 2009, there were 800,000 tickets "released" and registering for these will be up to the 31st March. The 1st random lottery selection will occur on 15th April 2009 and tickets will be issued 1 year later in April 2010. The average price of these tickets is - $139 (R973) each, with the cheapest tickets for category 4 tickets being $20 (R140) each, while the most expensive tickets for the final will be $900 (R6300). The category 4 tickets will make up 15% of all tickets sold (450,000) and will only be sold to South African citizens. So how the heck do we all avoid such a mad random lottery process? The easiest and simplest solution and the one that Percy Tours will be providing is by offering Hospitality Tickets that we buy now to guarantee you a seat 100% of the time. These will obviously be a little more expensive, but due to the South African FIFA World Cup only happening once in our lifetimes, I think you will agree that it will be well worth the extra money. Private Suite - the ultimate viewing pleasure, in a private suite, with waitress service, food, drinks, air-con, tv, comfy sofas and loads more absolute luxury - you walk a few metres from your dining table, open large patio doors and your seats are right there. Shared Suite - as above, but shared with other people, so perfect for large groups or companies wishing to spoil their staff or business clients. Executive Hospitality - these are massive air-con luxury marquees erected in a “Soccer style Village”, literally metres outside the stadiums, where you will be dined and pampered in fabulous comfort, with bands and entertainment, bars, large lounges and communal areas. Then when the match begins you walk a short distance into the Stadium & take your seat for the game. These seats will be the closest to the pitch and are the first tier of seats up from the touch-line. Incredible viewing, I hope you will agree. N.B - FIFA are being a little bit cheeky and many of these packages must be purchased in multiples of 4 for Shared or Executive, therefore meaning that if you just wished to watch the semi-final and final of 2 matches, you will need to buy a minimum of 4 tickets for each match - therefore meaning - 2 matches x 4 tickets = 8 tickets. Ok, that’s the seating arrangements, now to the ways you can watch the matches. 1. The Big 5 Series - this is the utter cream-of-the-cream product - watch a staggering 36 matches. This is designed for groups of 15 to 32 seats in one go and totals 850 tickets. This being the largest single ticket allocation and with SO many matches means that it is rather costly, are you ready for the price??? $1.5million, yes you read that right $1.5million - for a Private Suite. Phew - that is quite a bit of cash. 2. Gauteng Series - watch ALL the matches in the 3 stadiums in Jo'burg and Pretoria - 21 matches in total, 550 tickets for 15 to 32 seats. Private Suites is a total price of $962,500, Shared Suite is $31,500 x minimum of 4ticket packages = $126,000. 3. Venue Series - watch ALL the matches at ONE stadium. As there are 10 stadium and each one has different quantities of matches being played, then this means that there are loads of options and various prices, but let's just explain one so you understand the logistics and pricing. Let's say you wished to watch all the matches in Durban which will host 7 matches and you wanted a Executive seating package - then that would be 7 matches priced at $9,800 each, with a minimum of 4 tickets purchased = 4 x $9,800 = $39,200. This product is ONLY available at an Executive Hospitality level, which means a minimum of 4 tickets must be purchased. 4.1. Series 4 - watch 4 matches - Round 16, 1/4 final, Semi final & Final, going via PE, Cape Town, Ellis Park & Soccer City. Cost - $14,000 x 4 tickets = $56,000. 4.2. 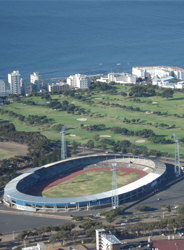 Series 3 - watch Cape Town AND Durban Semi-Finals & Final at Soccer City. Cost - $15,000 x 4 tickets = $60,000. 4.3. Series 2 - watch Cape Town OR Durban Semi & then the Final at Soccer City. Cost - $12,000 x 4 tickets = $48,000. 5.2. - Team Specific Series 7 - watch ALL 7 matches played by your team and if they are knocked out at any stage, then you watch the Round 16 & Semi at Cape Town, before going to the final at Soccer City, Jo'burg. Costs -Series 3 - minimum of 4 Executive tickets x $4,500 = $18,000. Series 7 - minimum of 4 Executive tickets x $17,500 = $70,000. Other info -To allow you to not be constantly packing and unpacking your suitcase, how about staying in one accommodation place in one city and get flown to each match in the morning and flown back again that evening? I quite like that idea. 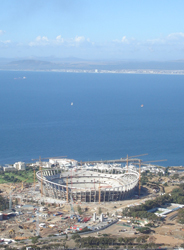 Oh and on the accommodation side of things – it is rumoured that FIFA has taken EVERY room in EVERY 5 star hotel in Cape Town - that is not only a huge amount of people staying in absolute luxury, but a city where all the partying will be done by the rich and famous (it would appear)! So forget 5 star hotels in Cape Town, if you were on the look out for that - because it will not be available. (Other Accommodation suggestions are mentioned below). Large Fan Parks outside each stadium will allow those without tickets to watch each game at that venue on enormous TV screens, with many additional facilities. Road closures around the venues will start 5 hours before each match. FIFA has commissioned exclusively 32 jumbo jets from Emirates. Percy Tours applies for all your tickets, with the application process taking about 10 to 20 days - so as to make sure that terrorists, ticket touts, soccer hooligans and many other undesirables are not allowed to purchase tickets. Then an acceptance letter is sent out - 30% deposit MUST be paid within 30 days. and the final 40% is due before 30th November 2009. If application paperwork is presented after 1st July 2009, then 60% deposit is payable within 30 days and the remaining 40% before 30th November 2009. ANY deviation from these payment terms and your application is thrown out - with a cheeky sub-clause stating that we might not get our deposits refunded ever. Our Hospitality tickets will be issued in January 2010, 3 months ahead of the "normal" tickets. Percy Tours is insisting with the ticket issuing company in Cape Town that Percy Tours will personally collect these tickets IN PERSON and no 3rd party is to handle our tickets. Lost tickets are just like lost tickets to any concert - NO entry, NO re-printed tickets, NO refund - so NO fun basically. Each ticket will have on it - ID details, embossed, fraud counter-strips and many other completely individualised and personalised details of EACH person/company that purchased the ticket, therefore, they hope, completely stopping ticket touts or anyone selling-on tickets, or stolen tickets being used by the wrong persons. FIFA will also be strictly enforcing a policy of NO selling-on-for-profit for any tickets purchased. Minimal booking arrangement and management fees are allowed at a small add-on price of less than 1% of the ticket price, equalling about R1000 per ticket. ALL prices quoted above are the cheapest you will obtain and are the very same prices across the entire planet that FIFA has set in place and every official ticket issuing agent will quote you that exact same prices, as we are all going straight to the official ticketing company. There will only be ONE official company in each geographically region issuing tickets. So ladies and gents these are the rules of engagement and we had better play by their rules as they hold all the cards - or should that be TICKETS. Percy Tours ideas and logistics (and big advantage to YOU) -Personally we are up for the Executive packages. Obviously we can arrange ANYTHING you want, but so as to save you all a huge amount of time, hassle, heart-ache and stress to obtain guaranteed tickets, Percy Tours will apply for all our required tickets in one go and "bundle" our ticket applications together. This will help everyone, as there are bound to be people who require sets of tickets that are not in multiples of 4's. So Percy Tours will be able to "bundle" the odd numbers together and apply for you all as one collective group. What also will occur is that Percy Tours will have all our seats together in one specially allocated area, so we all know where we are sitting for meals and the matches in the stadiums. Just to give you a small understanding of the logistics from our side - we are currently sitting on over 35 enquiries from around the world, totalling over 470 people (currently), wishing for us to assist them with their ticketing, transportation, tours, accommodation and activity requirements. Now I would be a fool to dream that all these existing 470 people will finally book with us, but we also have to consider that these are the very organised ones and Percy Tours is bound to obtain many more enquiries as the clock starts to tick down to match day and if I were realistically modest I would guess we could be looking at about 1,500 people possibly wanting our help. Percy Tours will also be booking all your accommodation and activities that you wish to do between soccer games. Accommodation - we deal with every conceivable type of accommodation establishment, from backpacker hostels, B&Bs, guest houses, lodges, wine farms, game parks, city apartments, beach side chalets to penthouse mansions, 1 star to 5 star hotels and everything in-between.......and in EVERY location that you wish for. Please inform us of your budget per person per night and your desired type of accommodation in which location and we will research, arrange and book it all for you too. Activities - Not only will all the football keep you very busy, but South Africa is an adventure play-ground offering 100's of diverse activities too. Please check out our websites "What to See and Do" page, where at the bottom of the page is a clickable link to a page of 300 different things to do.